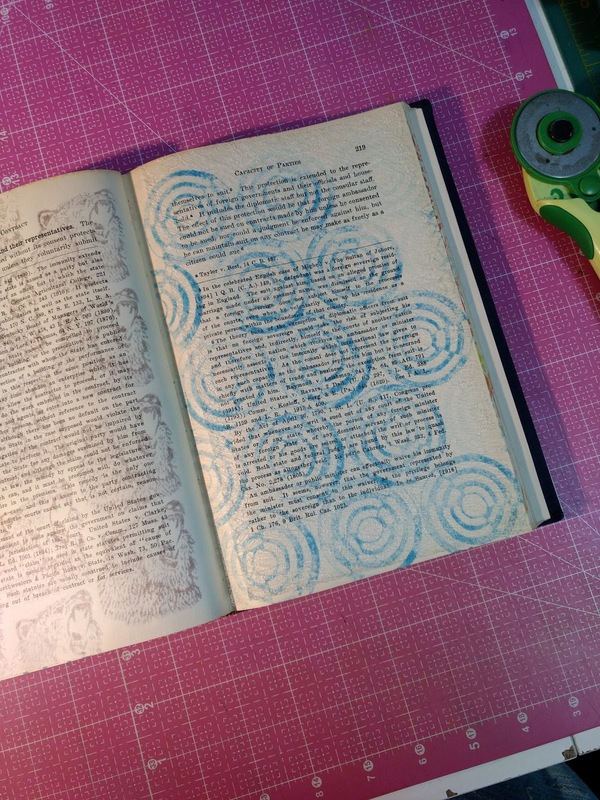 You might have noticed I enjoy stamping in an old book. It is a book I saved from the recycling bin at the main library. It is titled "Principles of the Law of Contracts" published in 1939. 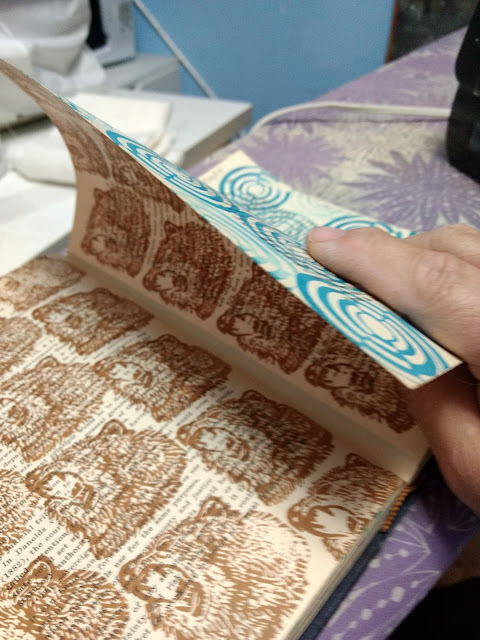 The binding is great and the pages are sturdy but the pages aren't quite thick enough to keep from seeing images printed on the next page. 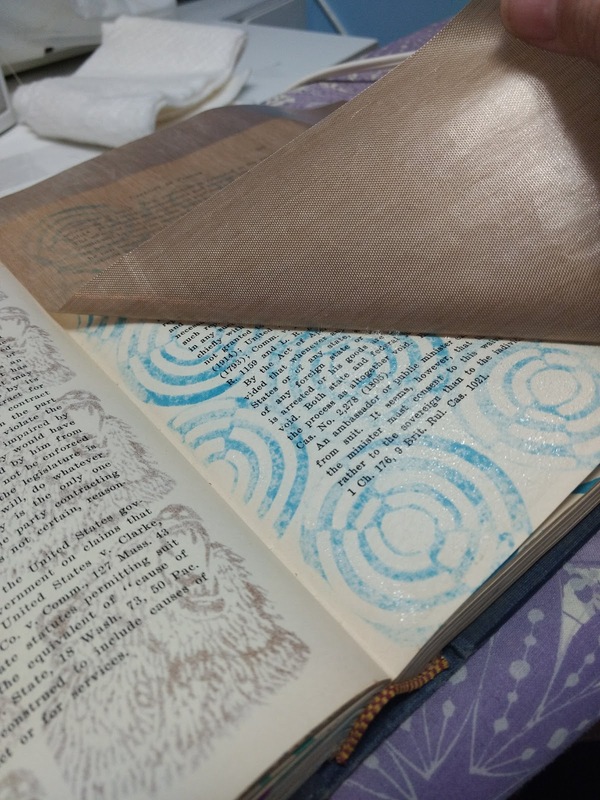 I decided to Mistyfuse the pages together. 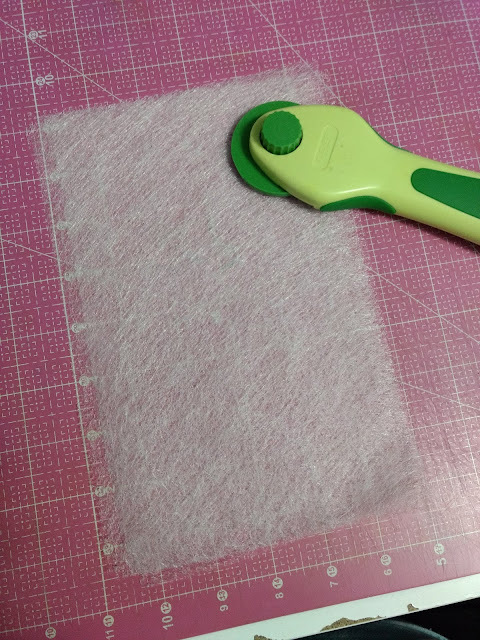 I thought I would share how easy it is to glue paper together with Mistyfuse. Cut a stack of Mistyfuse just a little smaller than the book pages. Only one piece of Mistyfuse is needed per pair of pages. Lay the Mistyfuse on the right hand page and cover with a Goddess sheet. 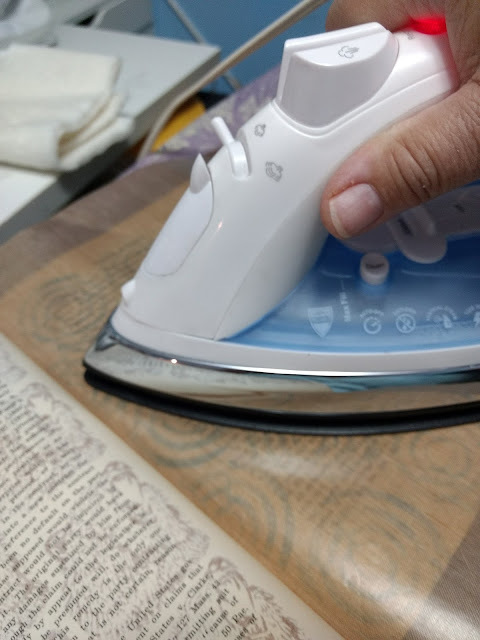 Move iron across the page to fuse the Mistyfuse to the page. 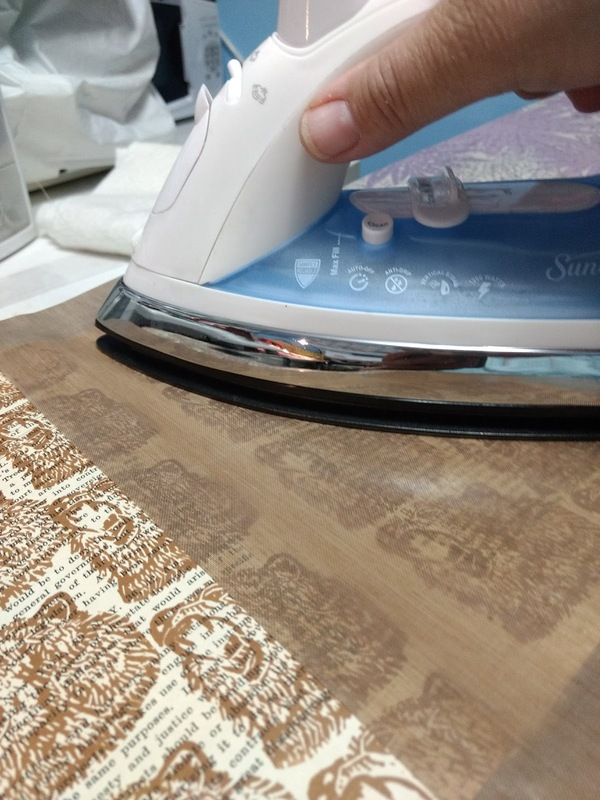 Be sure to keep moving the iron to fuse evenly. Pull up the corner of the Goddess sheet to make sure the Mistyfuse is adhering. Keep ironing if the Mistyfuse comes up at all. Remove the Goddess sheet once you can see the Mistyfuse has adhered to the paper. Turn the right page over the left. 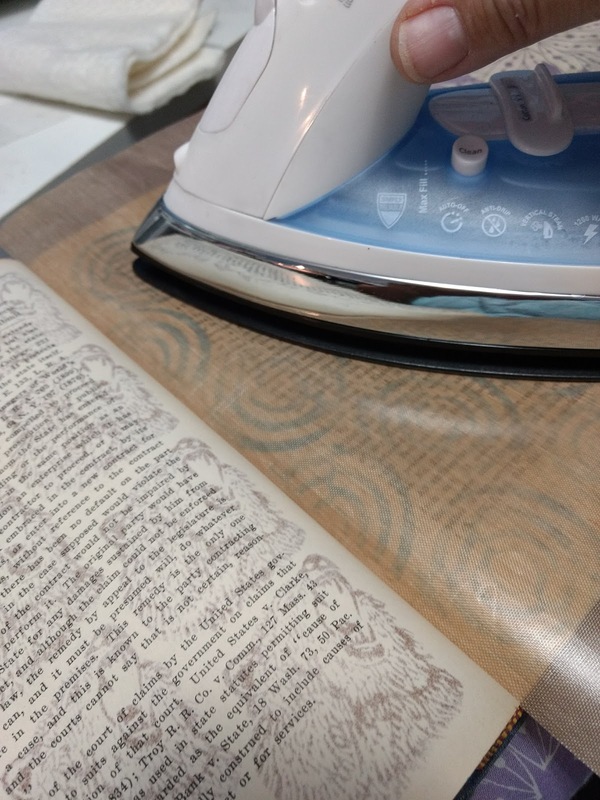 Place the Goddess sheet over the two pages and iron continuously until fused together. 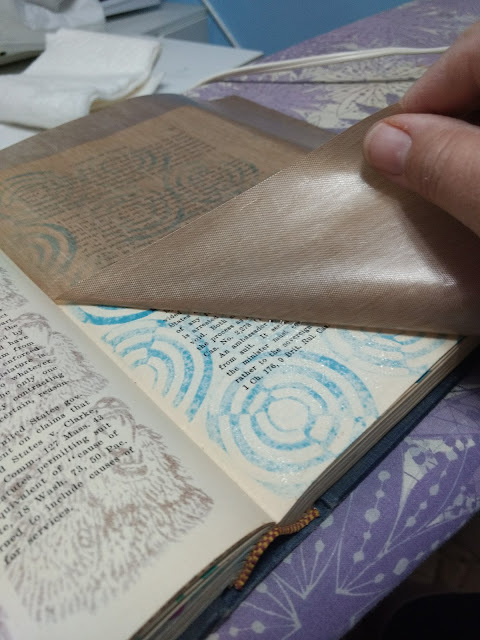 The pages are now sealed together. The pages will be stiff because of the weight of the paper but they still bend like paper, and I can stamp away without worry that the images will show through on previous pages. Mistyfuse can fuse almost anything! What a great idea to use mistyfuse instead of glue!! Love it! Thanks.